Benthic surveys were conducted in the Gulf of Farallones National Marine Sanctuary (GFNMS) aboard R/V Fulmar, October 3-11, 2012 using the large observation-class remotely operated vehicle (ROV) Beagle. 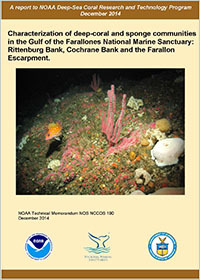 The purpose of the surveys was to groundtruth mapping data collected in 2011, and to characterize the seafloor biota, particularly corals and sponges, in order to support Essential Fish Habitat designations under Magnuson-Stevens Act (MSA) and other conservation and management goals under the National Marine Sanctuaries Act (NMSA). A total area of 25,416 sq. meters of sea floor was surveyed during 34 ROV transects. The overall research priorities were: (1) to locate and characterize DSC and sponge habitats in priority areas; (2) to collect information to help understand the value of DSCs and sponges as reservoirs of biodiversity, or habitat for associated species, including commercially important fishes and invertebrates; (3) to assess the condition of DSC/sponge assemblages in relation to potential anthropogenic or environmental disturbances; and (4) to make this information available to support fisheries and sanctuary management needs under MSA and NMSA requirements. Citation: Etnoyer, P. J., Cochrane, G., Salgado, E., Graiff, K., Roletto, J., Williams, G., Reyna, K., Hyland, J. December 2014. Characterization of deep-coral and sponge communities in the Gulf of the Farallones National Marine Sanctuary: Rittenburg Bank, Cochrane Bank, and the Farallon Escarpment. NOAA Technical Memorandum NOS NCCOS 190. NOAA National Centers for Coastal Ocean Science, Charleston, SC. 36 p.
Coral Reef Resilience Research and Management: Past, Present and Future! Appearing as solitary forms in the fossil record more than 400 million years ago, corals are extremely ancient animals that evolved into modern reef-building forms over the last 25 million years. The NOAA Coral Reef Conservation Program (CRCP) is a partnership between the NOAA Line Offices that work on coral reef issues: the National Ocean Service, the National Marine Fisheries Service, the Office of Oceanic and Atmospheric Research, and the National Environmental Satellite, Data and Information Service. The CRCP brings together expertise from across NOAA for a multidisciplinary approach to managing and understanding coral reef ecosystems. CoRIS: Thank you for visiting NOAA's Coral Reef Information System. Take our website user survey. We welcome your ideas, comments, concerns and suggestions.